It's the time of the year when gaming companies send me Christmas cards. Um, thanks? You didn't have to, really. Or at least just send an e-card, because I'm chucking these Santa-Yoda cards and fancy cursive well-wishes in the trash recycling bin. 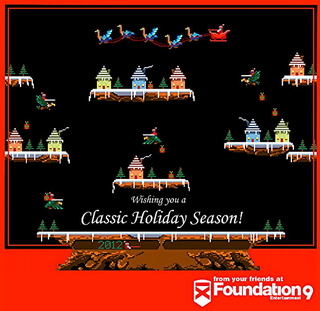 This one was e-mailed to me by the people at Foundation 9. Best card. They win. I will not put this one in the trash folder yet. Hey, game studios, Merry Christmas/Happy Holidays to all of you right back! Next time, tuck a Durango in that card you're sending me, ok? Or maybe an Orbis?